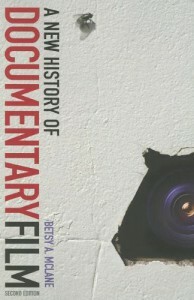 Betsy A. McLane recently finished writing a book-length history of Documentary Film with Professor Jack C. Ellis. It will be published by Continuum Books in late 2005. In 2001 Dr. McLane was the Executive Director of the Backyard National Children’s Film Festival. Prior to this she held the position of Executive Director of the International Documentary Association for eight years. This nonprofit media arts organization, with a membership of over 2500 worldwide, is dedicated to promoting documentaries and documentarians. She retains the title of Director Emeritus of IDA and is currently pursuing scholarly work in the documentary field. Dr. McLane has been a member of the faculties of Loyola Marymount University, Los Angeles, Emerson College Los Angeles Program, The University of Vermont, Art Center College of Design, and the University of Southern California. She has taught courses introduction to film, film history, television history, documentary history, film genres, media literacy, social responsibility of the media, and other related media topics. Dr. McLane is a Past President of the University Film and Video Association, the first woman to be elected to that office. For the UFVA, she also served as Executive Vice President, Director of the Eastman Scholars Competition, and as a juror for Next Frame Student Film Festival. Dr. McLane is the founding Director of the DOCtober (now InFact) Film Festival, a member of the Advisory Board of the Hot Springs Documentary Film Festival, a former advisor to the Sundance Film Festival “House of Docs” and a former member of the International Advisory Committee for the Toronto Documentary Forum. She has been a juror at the Sundance Film Festival, the Hawaii International Film Festival, the AFI Sony Video Awards, the Woodstock International Film Festival, the IDA Awards and DocuDays of Beirut, Lebanon. Dr. McLane has been a producer, fund-raiser, programmer, and presenter for three International Documentary Congresses held in 1989, 1992, and 1995 at the Academy of Motion Picture Arts and Sciences. In 2002 she represented American independent documentary at the Mercado Cultural in Salvador, Brazil, and in 2004 presented a major retrospective of American cinema verite for the International Documentary Film Festival, Amsterdam. She has also served as a review panelist for the National Endowment for the Arts Media Arts grant program and its Preservation Grants program. Dr. McLane is honored to have served continuously on the Advisory Board of the National Film Registry of the Library of Congress since its founding. She is currently serving as the festival advisor to the L.A. Harbour International Film Festival. Dr. McLane speaks and writes regularly on media topics and consults with independent filmmakers. From 1994 through early 2000, Dr. McLane was the publisher of International Documentary magazine. She was also Editor of the magazine for several issues, has contributed many articles. She was a founding member of the Advisory Board of Film History: An International Quarterly and for over a decade served as an Associate Editor of the Journal of the University Film and Video Association. Prior to joining IDA, she was Vice President of marketing and Promotion at Direct Cinema Limited, a specialized film and video distribution company where she was involved in all aspects of acquisition, marketing, advertising and promotions for a catalogue of over 200 titles. Dr. McLane has also worked on a variety of documentary productions in capacities such as researcher and grant writer.